The Baptismal Font is carved from one solid block of white Thassos marble, the same marble used by the sculptors of ancient Greece. There are three basins at three different levels; holy water cascades from one basin to the next in a continuous recirculating flow. The lowest level permits small children to dip their fingers in the holy water. The top level is for the baptismal rite. 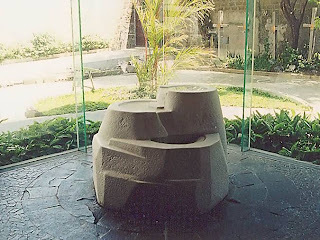 The three basins represent the Trinitarian nature of God; holy water recirculates to signify the oneness of this trinity. The most complete, or perfect, circle is the topmost basin, representing God the Father, followed by basins of decreasing degrees of completion, representing the Son and the Holy Spirit. The texture of the marble transforms from very rough, near the base, to a polished smoothness at the top level, to signify the spiritual purity of the human being, and how purest it is at the moment of baptism. The Baptistry is in a corner of the church that used to be exterior space. The triangular floor, covered in random-cut araal stone, follows the plan of the canopy overhead. Although clear tempered glass panels enclose the space, outdoor plants that border the space act as the visual boundary.